A Shaolin Kung-Fu master uses AN electric drill on his skull, tries to pierce himself with iron spears, and cuts his throat with a steel blade, all in the stunning footage obtained by RT. 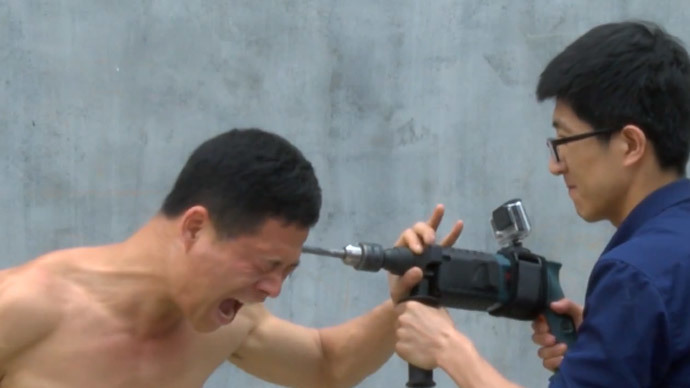 In the video, Zhao Rui performs a series of incredible stunts, intending to demonstrate how he had trained his body over the years of practicing martial arts. The 24-year-old is known as a celebrity in his hometown Mianzhu, southwest China. He began learning martial arts as a child, and ran away to join a Shaolin temple when he was 16. He studied for two years, before continuing his training with Kung-Fu masters. Zhao Rui had previously drilled a hole in his head while ripping off a piece of his skin, he told The Daily Mail earlier this month. “It was pretty painful but I got better and I learned from the experience and now I can practice pretty often without any problems,” he said. “I believe in making my body super tough. Believe it or not, I used to be quite nervous as a youngster but now that I can break stones with my head I have found it has given me lots of self-confidence,” the Kung-Fu master added.